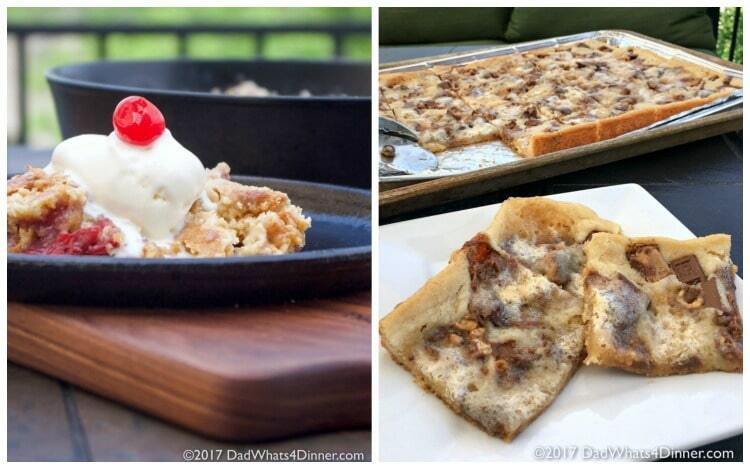 Your family will love these Two Unexpected Desserts Made on the Grill made with simple everyday ingredients. Take your grilling to a new level! Summer is here and it’s time to get your grill on. Okay, so everyone BBQs hot dogs, burgers and chicken but what about desserts? Yes, you heard me right. Delicious desserts? I was at my local Family Dollar the other day picking up supplies for summer and I decided to see what desserts I could make on the grill. Grilling fruit is easy, but what about cakes and cookies? Is it possible? Well yes, it is and today I will show you how easy it is to make these two delicious desserts using your grill. Both of these desserts could also be made over the fire if you are camping. When getting your outdoors ready for summer, don’t forget about your local Family Dollar. They stock more items than you think. 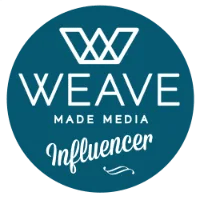 They are convenient and the prices are great. 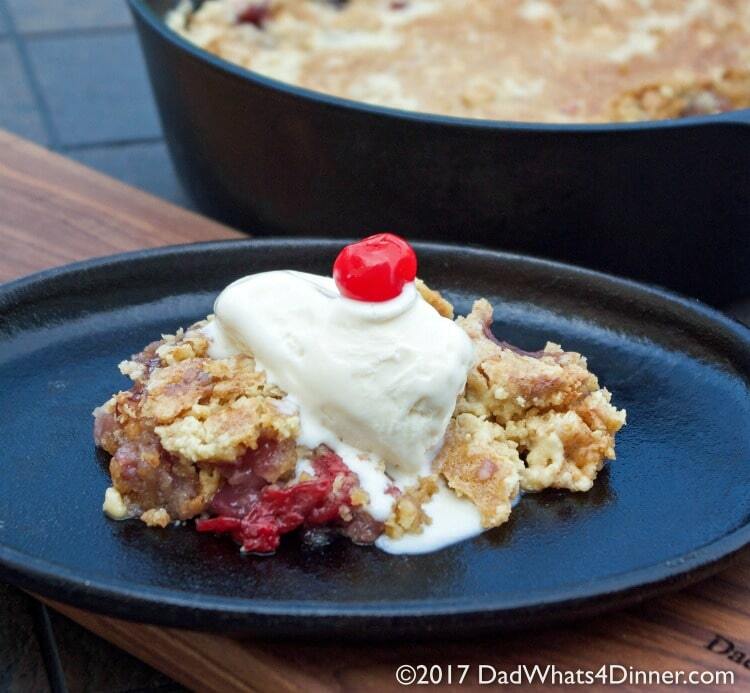 The Grilled Cherry Dump Cake is so easy and only needs 4 ingredients. To start, grease a cast iron skillet with oil. 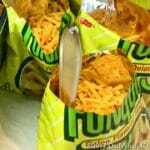 Dump in the cherry pie filling and pineapple tidbits with the juices. Stir together and then sprinkle with the yellow cake mix. Top the cake mix with butter. Heat your grill to 350°F. Place the cake, uncovered, on the grill and bake on indirect heat for 1 hour to 1 hour and 15 minutes, until the top of the cake is golden brown. 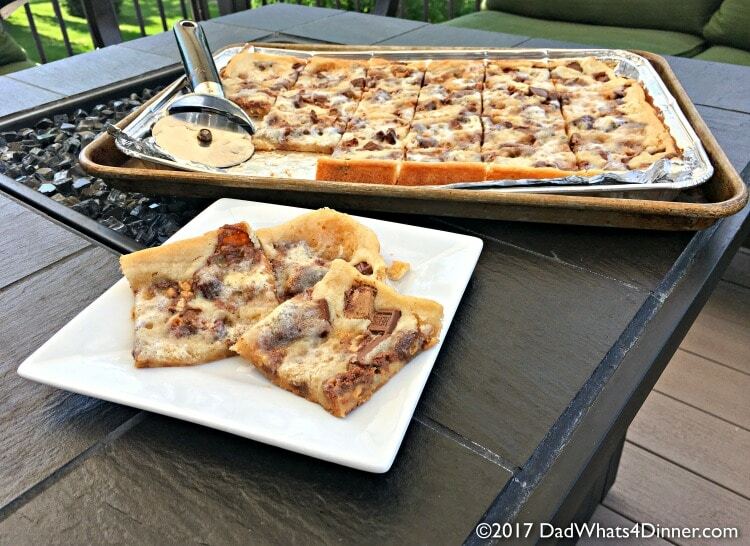 If your kids are not into cake, they will love making the Grilled Candy Bar Dessert Pizza. Start with a disposable grill pan from Family Dollar, lined with foil. Mix together three packets of sugar cookie mix according to package directions. 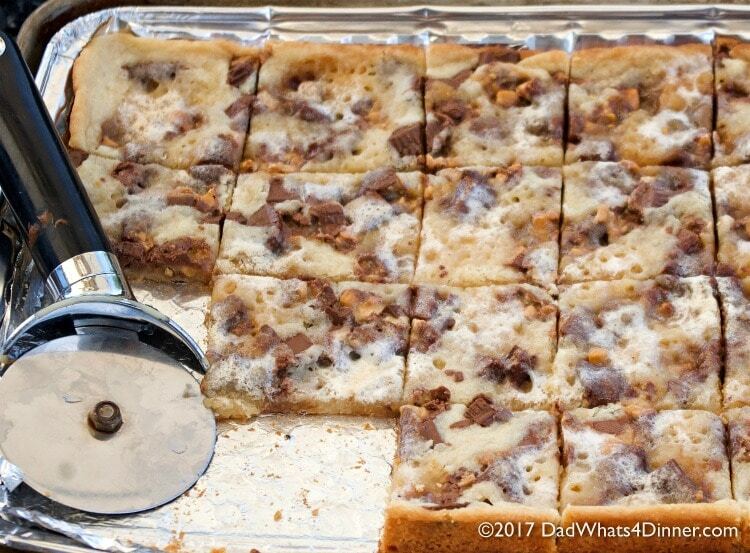 Press sugar cookie crust in prepared pan and top it with your favorite candy bar pieces. Add a few marshmallows and you are good to go. How awesome is that? Grill at 350°F, on indirect heat, for 20-25 minutes. Yum! So before summer ends, have a backyard campout with your kids. Chase fireflies, roast hot dogs and make these grilled delicious desserts that your family will love. Do you know where your local Family Dollar is located? Heat your grill to 350°F. Grease a cast iron skillet with oil. Dump in the cherry pie filling and pineapple tidbits with the juices. Stir together and then sprinkle with the yellow cake mix. Top the cake mix with butter. Place the cake on the grill and bake on indirect heat for 1 hour to 1 hour and 15 minutes, until the top of the cake is golden brown. Line a disposable grill pan from Family Dollar, with foil. Mix together three packets of sugar cookie mix according to package directions. Press sugar cookie crust in prepared pan. Top with remaining ingredients. Grill at 350°F, on indirect heat, for 20-25 minutes. The dessert pizza I could have totally thought of for the grill, but that out of the box idea for that cake?! Fantastic!! Thanks for stopping by Joanna! Maybe not necessary but fun for the summer! Both of these sound awesome! 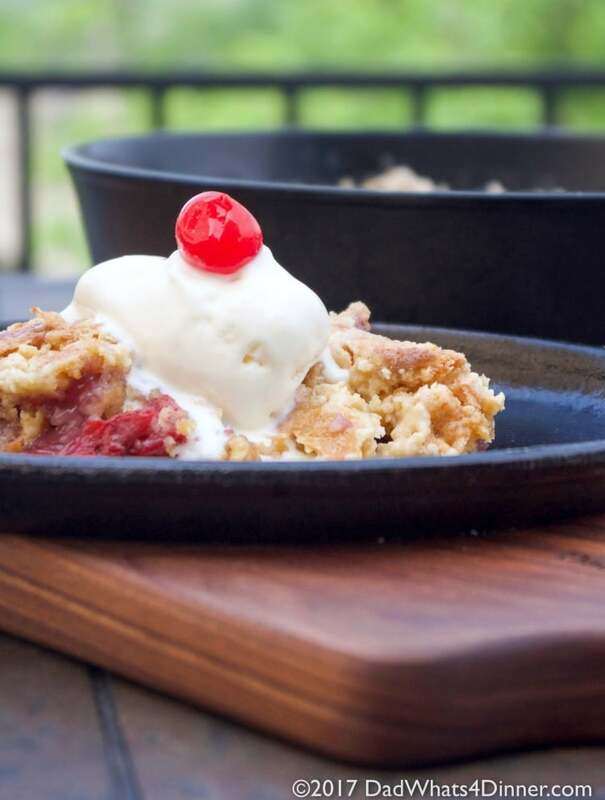 I love the idea of the grilled cherry dump cake. That would be good with peaches too. Yes, peaches would be great and it is so simple.Thanks for stopping by! These both look delicious. I love that you can make both of these on the grill and not warm up your home. Such great Sumer treats! Yes, it is way to hot to heat up the kitchen. Thanks for stopping by! Omg! Amazing ideas! I’ll define trying. Both of these soon! Thanks Francesca! I hope you enjoy! wow lovely desserts on the grill who knew you could make such decadent desserts outdoors now I want to try your creations! Thanks for stopping by Adriana. Let me know how they turn out. What a clever idea. With camping season on us, and just plain outdoor cooking this is such a fun way to make dessert! Will be passing these recipes along to my daughter. Thanks for stopping by Marisa. Yes, these are great for the grill or campfire. What a fun and delicious dessert idea for the summer…especially when it’s too hot for the oven!